CARMEL, Ind. 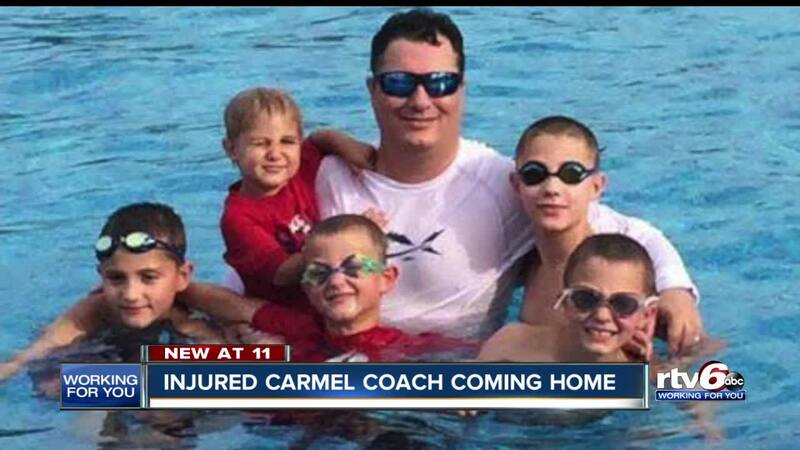 -- Girls basketball coach Kevin Sweeney has made it back home to central Indiana after being injured while on vacation with his family. Sweeney was brought back to Indianapolis from the Dominican Republic by a medical aircraft around 11 a.m. Friday. He was then transferred to St. Vincent's Hospital and has been seen by several doctors. His family told RTV6 he was playing in the water with his kids when the waves came in from behind and caused him to land face first. He fractured three vertebrae in the incident. A GoFund Me account was created to help cover the costs of the medical aircraft flight back to Indianapolis.